Planning the perfect wedding to your fairytale romance? This is the Ketubah for you! You and your Prince will be dancing into the future and nothing short of dragons and spells will tear the two of you apart! Inspired by the classic romantic tale of Sleeping Beauty, this Ketubah features a couple spinning away on the dance floor, her hair coming loose and her dress twirling, with their eyes only for each other. But don’t worry, she’s met him before… Once Upon A Dream! Perhaps you’ve dreamed of being the princess who wins her prince in the end, or perhaps you’ve dreamed of being the knight in shining armour that slays the dragon and saves the day. 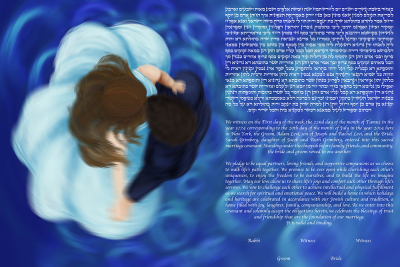 Either way, this Ketubah will fulfill all of your fairytale fantasies!